World-renowned chef and co-owner of the ever-popular Hoggs-n-Chicks and Live Oak Grill (with friend/partner Roque Baecker), Frédéric Perrier has partnered with longtime friend Tao La to bring The Slanted Frog to Fort Bend County! 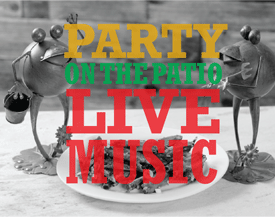 With a large patio, The Slanted Frog is planning live bands and even some outdoor cooking on the grill and smoker in the near future. Chef Perrier is also planning a funky and inexpensive wine list. Private events, catering and carry-out are all available. Bring your entire family and enjoy the comforts of The Slanted Frog. You will be glad you did!